Natalie's artwork has its unique identity and style. Painting is her biggest passion but during the years, photography became one of her favourite ways to capture her views and express her all-round creativity. Although she experiments gladly with materials and different techniques, her style can easily be recognized. In her paintings she uses strong coulours, unusual compositions and contrasting patterns that make details come alive. Sometimes she combines paintings with photography. She likes to bring a surrealistic atmosphere to her artwork. This manifests itself in edgy use of color, the presence of unknown plants, flowers and mutilated faces. All this is likely to alienate the viewer. 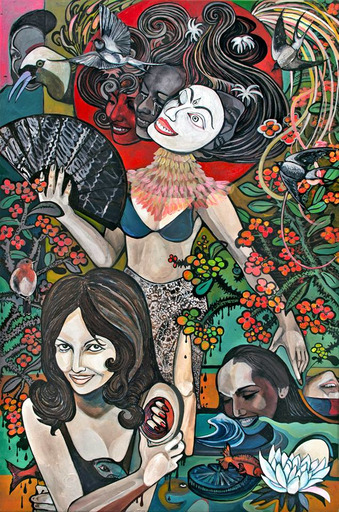 Often a visual reference to her partly Indonesian origin and her family's history, is added. Natalie's paintings will never be plain. On the contrary, there is always something that draws your attention and makes you wonder.